-Bamboo wooden 、wristwatch ,not only a watch on your wrist, but also a feeling of contact with nature. -Imported Japan quartz movement, guarantees precise and punctual timing. -Easy to wear and not easy to fall off. Due to 100% natural bamboo handicrafts,there maybe some spots of the bamboo,but not a quality problem. 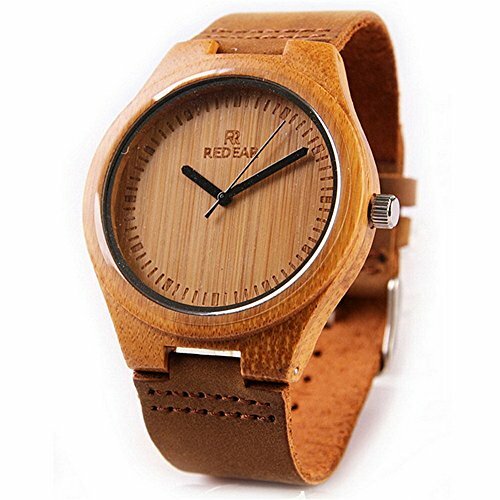 MATERIAL:Eco-friendly 100% natural bamboo wooden watch with a cowhide leather strap for men. Each one is hand-crafted, healthy and comfortable. SUPER LIGHTWEIGHT：This watch is so lightweight you'll forget it's there. The strap is made from full genuine leather. It's soft,comfortable and durable enough to fit on a variety of wrist shapes and sizes. PACKAGE:Our wood wrist watch is carefully prepared, packaged and delivered in our gift box.Great choice to families, lover, friends for Birthday, Valentine's Day, Father's Day ,Christmas. If you have any questions about this product by SHANGDONGPU, contact us by completing and submitting the form below. If you are looking for a specif part number, please include it with your message.